[News from News Center] At 8:30, Sep. 6th, YSU held 2017 opening ceremony for freshmen, also the pep rally for military training. 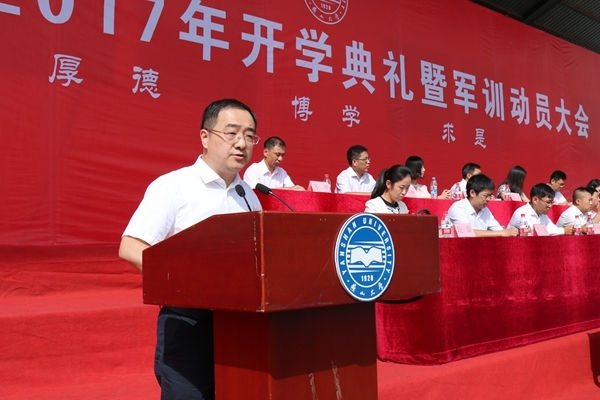 YSU leaders Weidong Meng, Hongmin Liu, Wanyu Sheng, Xiangdong Kong, Yan’an Xie, Rong Li, Yongsheng Zhao, Baocheng Wang, Sheng Huang, Dingxuan Zhao and leaders of schools attended the ceremony. 6215 undergraduates, 2244 graduate students, and 56 oversea students also witnessed this impressive moment. 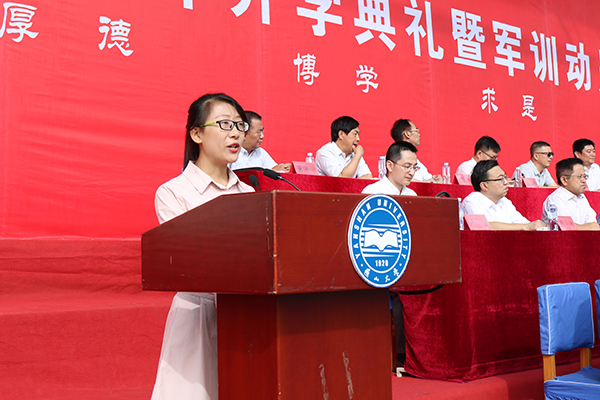 Jia Chan, Deputy Director of Student Affairs Office, hosted the opening ceremony. Starting with a solemn flag-raising ceremony, representatives of students, freshmen, teachers and parents successively addressed the ceremony. Representative of students Zhejing Li is making a speech. Representative of freshmen Jia Kang is addressing. Jia Kang, a freshman of Control Technology and Instruments Major from School of Electrical Engineering, shared his expectations before enrollment and feelings after enrollment. He called for all freshmen to focus on study, learn to behave themselves by cultivating morals, and seek for dreams but never forget original intention. Representative of teachers Wanlu Jiang is addressing the ceremony. Representative of freshmen parents Mr. Xingshu Zong is addressing. Che Zong is a freshman of Computer Science & Technology Major from School of Information Science and Engineering. His father Shuxing Zong told his past about missing YSU and expressed his expectations of freshmen. He hoped that freshmen would be cooperative, diligent and inquisitive, and seek practice & innovation, thus live up to the sweat, tears, and miss from parents. YSU leaders wore school badges and issued student ID cards for freshmen. The segment of YSU leaders putting on school badges and issuing student ID cards for freshmen was firstly set at the opening ceremony. Through this rite, students are expected to realize that they are truly the owners of YSU, and participants and witnesses of YSU’s development since the moment they received school badges and school ID cards. YSU President Hongmin Liu is addressing the ceremony. 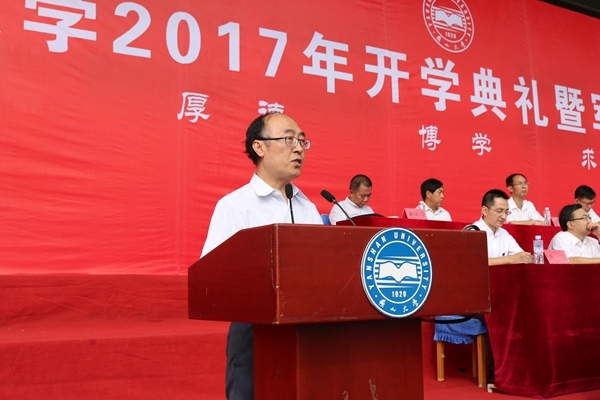 At last, YSU President Hongmin Liu made a speech entitled The Appearance of Dream. 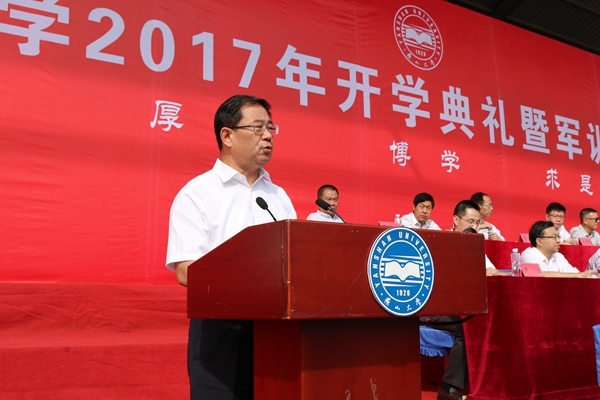 By telling the establishment of YSU for China, the extremely hard process of constructing YSU and hard-bitten YSU spirit, he highlighted that YSU’s dream and spirit forged present YSU. He encouraged all freshmen to be brave in having a dream and chasing it. A dream is the pursuit of excellence, and should be updated and can be achieved intently. 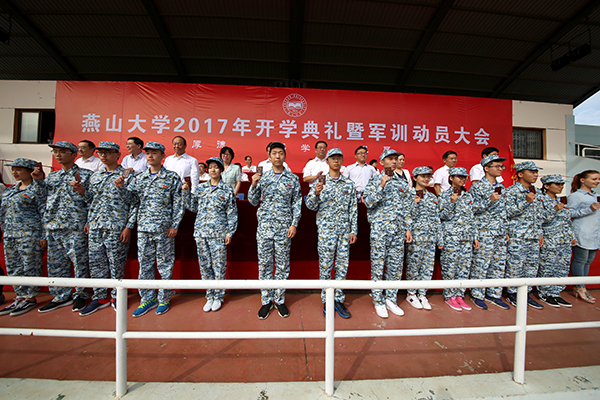 After the opening ceremony, the pep rally of military training for 2017 freshmen was held. Lei Duan, Deputy Director of Student Affairs Office, hosted the rally. 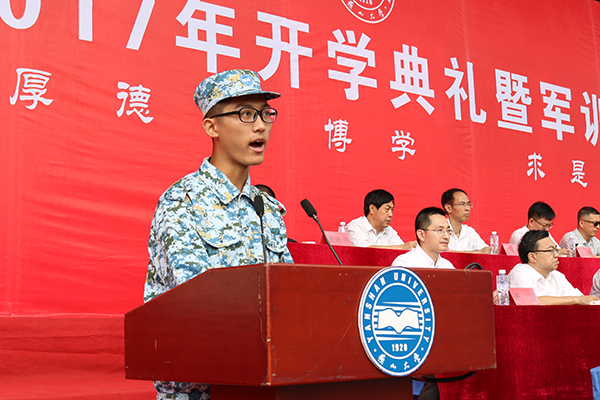 Jia Chan, Deputy Director of Student Affairs Office, read out The Decision on Conducting Military Training for YSU 2017 Undergraduate Freshmen. Vice President Sheng Huang is addressing a pep talk. 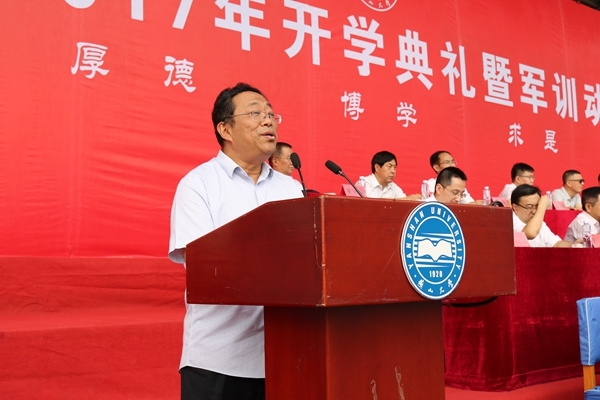 Vice President Sheng Huang addressed a pep talk. On behalf of YSU, he extended his gratitude to the unit of PLA for undertaking the training. He shared the significance of constructing a strong and solid national defense in a peaceful era. And he expected that all freshmen would have the motherland in mind and be prepared for adversities in times of peace, venture bearing rough time and set strict demands on themselves, and reach a unity of knowing and doing with a down-to-earth attitude and confidence. 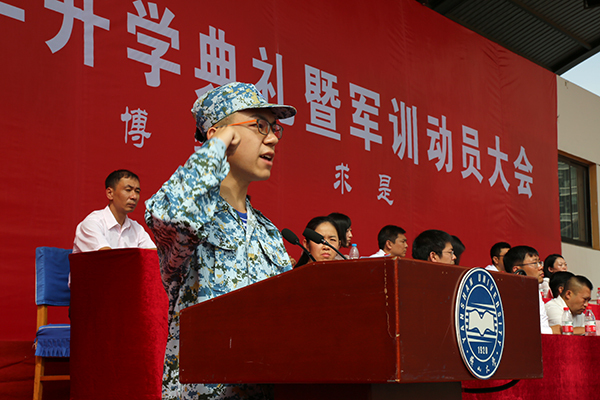 Deputy Brigade Commander of 66109 Unit, Chinese People's Liberation Army Yao Zhang is addressing. 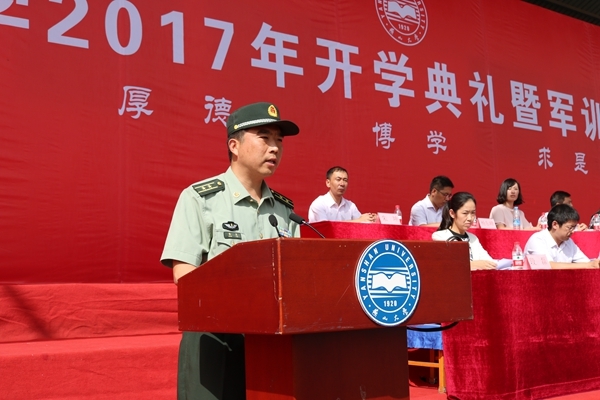 Deputy Brigade Commander of 66109 Unit, Chinese People's Liberation Army Yao Zhang expressed that they would strive for scientific training, patient teaching, strict organization, and absolute safety, and they would overcome all difficulties to complete the training tasks. Representative of trainees Zhou Fang is addressing. On behalf of all trainees, Zhou Fang, a Chemical Engineering and Technology major from School of Environmental and Chemical Engineering, promised that they would obey orders and follow directions, learn carefully and train hard, consolidate the achievement and promote the spirit. 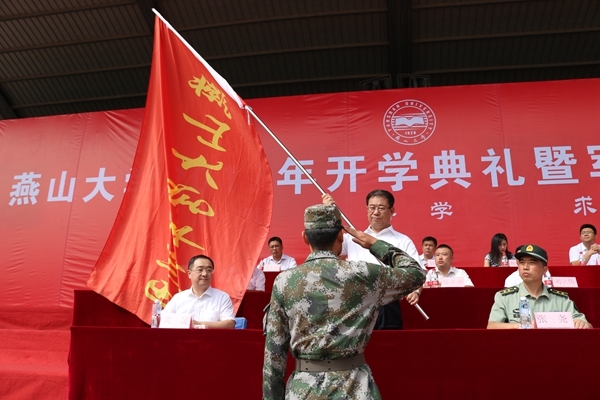 YSU President Hongmin Liu is conferring flag to military training regiment. 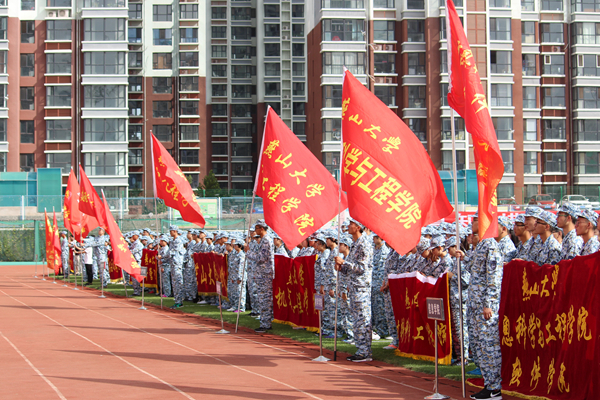 Then President Hongmin Liu conferred flag to military training regiment, which kicked off 2017 freshmen military training.